These cookies have a subtle lemon flavor and are not too sweet. I don’t like an overwhelming honey flavor, so I usually opt for a little less sweet. Cream together honey and butter. It should resemble frosting. Beat eggs. Add to honey and butter mixture. Add lemon juice. Mix well. Add almond flour, cinnamon, baking soda, and salt. Mix until combined. Stir in chopped pecans. Spoon dough by tablespoonfuls onto baking sheet, about 2 inches apart. 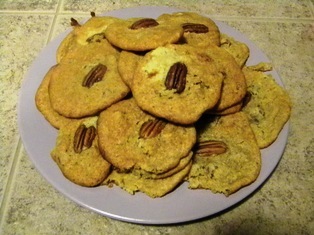 Place a pecan on the top of each cookie. Bake for 12 – 14 minutes until cookies are browned on the bottom and not too soft on the top (they will still be soft but shouldn’t seem raw). Another nut based flour – or nut butter would work, but not something like coconut flour.